Con, I throw them out as soon as I get them in my house. If I don't they end up in the trash any way because they wander off and get lost. I can't read with them on my book unless they are taped on like they do for library books. On my own books, I keep the dust jackets. But when I read the book, I set the dust jacket aside because it bugs me. Then I put it back on to store the book on the shelf. With kid books, I figure we are likely to donate hardcovers to the library, and the hardcovers are WAY more useful to the library WITH dustjackets. So I set the dustjackets aside, and reunite upon donating. Like you, I have removed all the kid book dustjackets and stored them separately. For the longest time my girl proudly referred to them as her own special "collection." I took off all the kid dust jackets because they were getting destroyed during kid reading. I kept a few of the loveliest ones, but got rid of them all in a move a couple of years ago. I love dust jackets. I do use them as bookmarks. My husband removes them. I think they're rather sad in their flaccid state and I'd rather throw them out than store them. I've never heard of anyone taking off the dust jacket before. Really. We trash them if they're too deteriorated to stay on anymore. There's a lovely one on our copy of Chabon's book of essays Maps and Legends which I keep having to repair with tape because I tear it getting the book on and off of our tightly-packed bookshelves. Con - I can't stand them. Early on, I saved the kids' book covers because they do tend to be pretty, but I've given up over the years. Thorn in my side. The anti-Hoarder in me wants to throw them away. My husband has removed them from the kids' books and then stores them away. Every so often, I run into a bunch of them and out they go! Nobody misses them and with kid's books - what's the point? I have no intention of selling the books and the dust jackets - at this point - add nothing to the value. They are an annoyance and just get destroyed if kept on and clutter up storage space if kept off. Toss, I say. 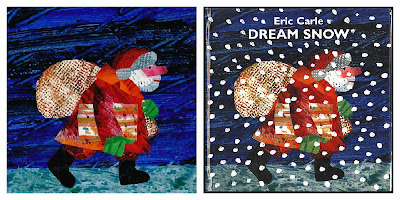 Ohhhh Eric Carle. I miss those days. And those book jackets. I always remove them because they get all slippery as you said. But then I put them back on once I'm finished reading. I take them off for reading and put them back on later.